A study released this week sheds new light how vulnerable marine mammals are to increased traffic in the Arctic. As sea ice cover has decreased in recent decades, the number of vessels that pass through Arctic waters has increased. With more ice loss predicted in the years ahead, there’s potential for even more ship traffic. Researchers with the University of Washington looked at 80 subpopulations of 7 different marine mammal species throughout the Arctic. They focused on the month of September, when sea ice extent is at its lowest. 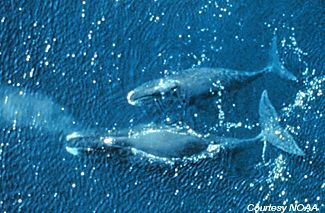 In Alaska specifically, bowhead whales got the highest vulnerability rating, partly due to the fact that their fall migration crosses the two main Arctic shipping routes in the Chukchi Sea. Donna Hauser is the lead author of the study. She said certain aspects of bowhead whale behavior make them especially vulnerable to ship traffic. “Things like slow speeds; they spend a lot of time at the surface, particularly when they’re foraging, and so are more likely to potentially actually get hit by a vessel,” said Hauser, who is now with the University of Alaska Fairbanks. Hauser said she hopes the study can be useful in creating guidelines for vessel traffic in the future. “We could aim to develop some mitigation strategies that would help ships avoid key habitats, adjust their timing, take into account certain migration routes and times…as well as make some efforts to minimize sound disturbance by changing vessel speeds,” Hauser said. In May, the International Maritime Organization established the first international guidelines for vessel traffic in the Bering Strait. Those guidelines take marine mammal safety into account as well as other natural hazards related to climate change. Hauser said the new study provides an opportunity to build on those efforts.